We are about to unfold the story of Boris Karloff, an actor and a gentleman. It is one of the strangest tales ever told. I think it will thrill you. It may shock you. It might even… Horrify you. So if any of you feel that you do not care to subject your nerves to such a strain, now's your chance to… hmm, well… We warned you! Welcome to the Boris Karloff Blogathon! This week, I’ll kick back — as Boris did, pictured here on the set of Frankenstein — and let over 110 of my best friends do all the work! I’ll be busy enough just keeping up and posting links to all the participating blogs. I’ll be updating links here throughout the day, every day, all week, so keep coming back and be a part of the celebrations. Click around, discover new blogs, enjoy all the posts, and when you see something you like, let the blogger know. Leave a comment! We’re all in for a good time, so enjoy and, should anyone ask… Tell them "Boris sent me". First post honors go to Sara Karloff who shares a birthday — today! — with her father. "What a wonderful Birthday present this weeklong blogathon honoring my father, Boris Karloff is. I know he would be overwhelmed and flattered. It is thanks to the fans that my Father's legacy has the stature and longevity it does. Without you, the fans and students of film and the terror genre, my Father's career and popularity would not have the iconic status that it does. Thank you all from our entire family." Thank you, Sara, for your kind message. This week, bloggers and fans come together to celebrate the life and the extraordinary career of your father, Boris Karloff. Please accept these humble efforts as our gift to you. 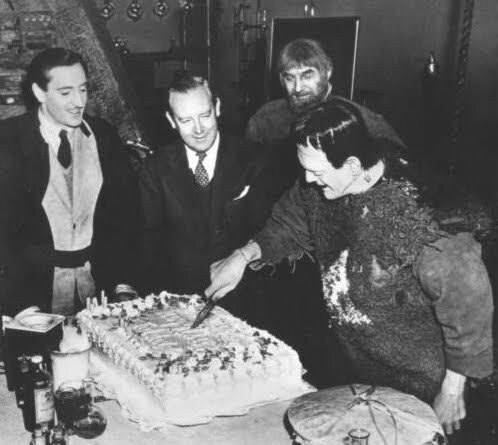 Boris Karloff was in Monster costume and cutting into his surprise-party birthday cake on the set of Son of Frankenstein (seen here with Basil Rathbone, director Rowland V. Lee and Bela Lugosi) when Sara Jane was born. 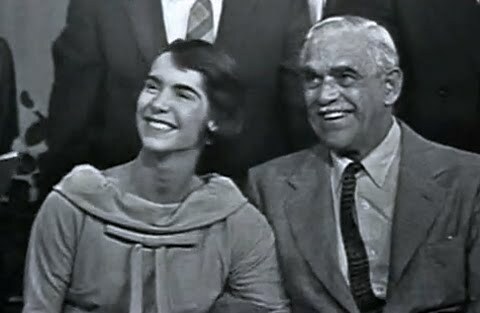 Twenty years later, on November 13, 1958, just 10 day short of another shared birthday, father and daughter appeared together on live TV, when Boris was surprised again, this time as a very reluctant guest of This Is Your Life. It’s a wonderful document, capturing Karloff in his later years, a beloved movie star with a long, illustrious and still prolific film career, and a familiar and favorite television guest. As the show starts, you see Karloff, a shy and intensely private man, genuinely surprised and visibly annoyed at being singled out like this. As he warms up, ever the professional, and comfortable among friends, you see his natural humor and easy generosity shining through. When Jack Pierce is introduced, Karloff calls him “the best makeup man in the world”. As the show closes, young Sara Jane is introduced, and you can see the affection there as they hold hands and beam at the camera. The Boris Karloff Blogathon: It’s Alive! My Lucha-masked friend Filo Loco is already partying, which shouldn’t be a surprise to anyone. Filo literally switched on the Boris Karloff Blogathon when November 23 rolled around six hours ago, Paris time. 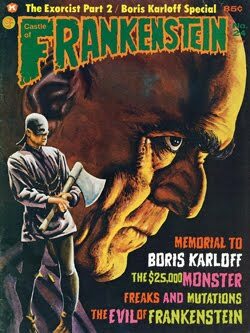 Filo has posted a rare interview with Boris by Mike Parry and Harry Nadler, direct from the pages of the Karloff Tribute issue of Castle of Frankenstein, originally published in 1974. Go see, on Deadlicious. Why not start with Boris Karloff’s last film? 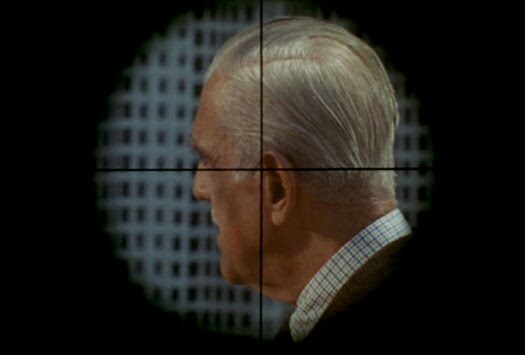 Booksteve offers an overview of Karloff’s career, culminating, in the spring of ’68, with four films shot back-to-back in Hollywood for a Mexican studio. Read The Incredible Invasion, on You’re Only As Good As Your Last Picture. How’s your German? Here’s another early European contribution from Peter of Six Shooter. First, William Henry Pratt is a short biography of Karloff, and an appreciation of the actor’s unusual turn as a vampire in Mario Bava’s Die drei Gesichter der Furcht — The Three Faces of Fear — known in America as Black Sabbath. 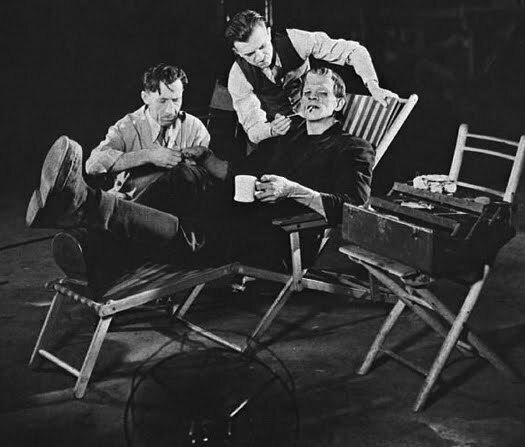 Daniel Geer writes, “Our entire perception and understanding of what made Frankenstein’s Monster who he was is owed to Karloff’s performance”. Read Daniel’s tribute, For the Love of Karloff, on Popcorn Monster. Daniel also posted trailers to a number of Karloff films, and a Top Ten List of Classic Horror Films. 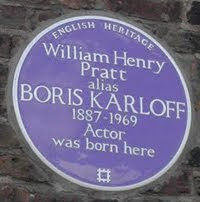 So reads the commemorative plaque honoring Boris Karloff at St. Paul’s Church in Covent Gardens. It’s on view, with other stills posted by Diane in celebration of Boris’s birthday, at Wouldn’t You Like to See Something Strange? We’re barely two hours into this week-long Blogathon and already my head is exploding with a combo review of 1965’s Die, Monster, Die by two of my favorite bloggers! Kimberly Lindbergs of the formidable Cinebeats posts a heartfelt appreciation of this “entertaining mess of a movie that benefits greatly from Karloff’s presence”. An AIP film shot in England, Die, Monster, Die, was very loosely based on H.P.Lovecraft’s The Colour Out of Space”. Over at the amazing Groovy Age of Horror, Curt Purcell offers up sample pages from the Dell Comics adaptation of the movie. Penciled by John Tartaglione, if I’m not mistaken. Professor Brian O’Blivion weighs in on what merits can be found in Voodoo Island, a 1957 potboiler featuring woman-eating plants, crab puppets, and widespread zombie-like behavior. Karloff, we are told, “definitely adds class to this otherwise cheap time waster”. The review, though, is highly entertaining. Read Boris Karloff and the Wall of Voodoo, on The Cathode Ray Mission. "Boris Karloff is a part of our lives,” writes Caftan Woman as she celebrates Boris and “her highness” Sara Karloff’s serendipitously shared birthdays. It’s a sweet, touching piece, complete with a Karloff-related quote… by Ralph Kramden! Read The Princess and the Late Bloomer, on Caftan Woman. Gary Lee tracks his passion for comics and pop culture to a Boris Karloff comic. I’m sorry, Gary. If you want to blame Boris, you’ll have to get in line! Read Blaming Boris on Gary’s Goods. Blogger Michael Sensei is an English teacher settled in Japan where he reports on pop culture, theirs and ours. Case in point: Bikini Beach movies, including Boris Karloff’s 1966 Heavenly Bikini (known hereabouts as The Ghost in the Invisible Bikini). Also referenced is Karloff’s voice acting job on Mad Monster Party? (1967). Up on My Two Yen Worth. Todd Franklin, the estimable mayor of Neato Coolville has posted some nice pics of Boris. He’s also doing a daily series of Karloff Quotes on his Weird Hollow blog. Almost immediately after Frankenstein, Universal reunited Karloff and director James Whale for The Old Dark House (1932), revisited here by Steve Miller. A brilliant, jet-black comedy, the film tanked in America and, abandoned by the studio, was lost for decades. When you’re done reading Steve’s review, keep going! His blog, The Boris Karloff Collection, is entirely devoted to our Blogathon guest, with lots of information and some very nice screen caps. I’ll be posting Karloff images all week on my picture blog, Monster Crazy. Up now is a wonderful shot of Karloff with, appropriately, a birthday cake, though it was originally meant to celebrate the 150th anniversary of Mary Shelley’s Frankenstein on the cover of Life magazine, in 1968. Also featured is the stunning duotone poster for The Black Cat that sold at auction earlier this month for a whopping $344,600. Largely forgotten today, bandleader and comic Kay Kyser, “the Ol’ Perfessor”, was a recording, radio and freshly-minted movie star when he made You’ll Find Out in 1940. 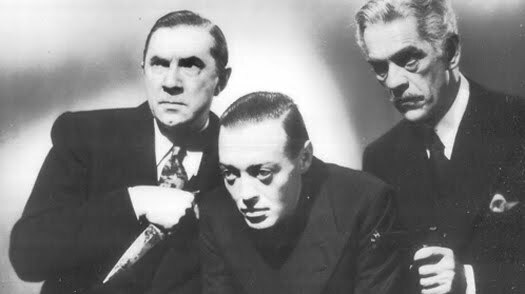 The light-headed and somewhat dated comedy is noteworthy as the earliest “monster rally”, with three big-name Boogeymen conspiring to provide the menace, namely a very sinister Boris, the beady-eyed Peter Lorre, and Bela Lugosi, seen wearing a swami’s turban. Writer Paul Castiglia provides a synopsis, context and a concise analysis of You’ll Find Out on his new and instantly essential blog, Scared Silly — launched at Halloween — devoted to horror comedies. When you click through, go back over recent posts: There’s a wealth of Karloff material that Paul ran all last week, counting down to the Blogathon. Quote Boris: "When I was nine I played the Demon King in Cinderella and it launched me on a long and happy life of being a monster." The Igloo Keeper goes all high-tech on us, using Google Earth to locate Boris’s birthplace, now immortalized with a English Heritage plaque. See where Boris grew up and meet the Reverend who first cast Boris as Monster on The Igloo of the Uncanny. 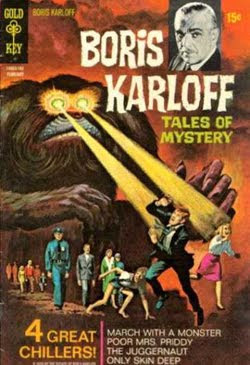 Boris Karloff, comic creator? Hiding in a three-for-one bag, a Boris Karloff comic book finds it’s way to rural Nova Scotia and into a fan’s heart. On Orange and Black, where it’s Halloween all the time. Ray Young may not know it, but he is among a handful of writers who inspired me to blog, and once I got started, his allowing me to participate in a Luis Bunuel Blogathon he was running proved to be an exhilirating and formative experience. So you see how I would have been proud enough just to have him contribute to the Karloff Blogathon, but then he goes and, in a few short paragraphs, he nails it, revealing the actor, his meaning and his position in the cinema scheme of things. Wow. Thank you, Ray. Read Ray's Reflections on Boris, on Flickhead. Mike Segretto surveyed Karloff’s career and expertly justifies every one of his picks of 10 Essential Karloff performances, on Psychobabble. If you are not yet aware of John McElwee’s blog, be warned that you’ll spend hours there plowing through the archives. For fans of classic cinema, Greenbriar Picture Shows is a blog of the first magnitude. In his tribute to Karloff, John ponders the actor’s tenacious popularity and relates how he grew up with Karloff, a persistent television presence through the Sixties, sampled in old films and numerous TV appearances including Shindig, where an elderly Boris appeared surrounded by gyrating gogo girls. The post, as usual for this blog, is accompanied by a jaw-dropping complement of rare images, all clickable for giant-sized enjoyment. Illustrator Rob Kelly's Monster-themed Public Service Announcements are a joy to behold. 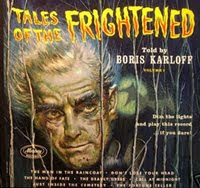 The Blogathon inspired him to create a special Karloff PSA. “You’re the most blasphemous looking thing I’ve ever seen,” Boris Karloff is told, “It’s a miracle you’re not struck dead.” And this is not from a horror film! In a nice change of pace, film critic Doug Bentin reviews Five Star Final, a film released two months before Frankenstein, and just one of the 16 features Karloff made in 1931. The review is cross posted on the Oklahoma Film Critics Circle and on Bentin’s Miscellany. Good luck with the new blog, Doug! There a wealth of eye-popping Karloff material up on the tumblelog Monsterman. How about some Karloff Fun Facts? Dial 'em up on Raven Faes Creations. In a bizarre variation of the mad scientist theme, Karloff communicates with the dead via radio waves in The Devil Commands (1941). Writer Erich Kuersten provides a sharply written review and places the film in it’s social and historical context. Read it on Acidemic. By the way, maybe it’s just me, but I think the corpse helmets are really cool. A bunch of Karloff comic book related links up on Super I.T.C.H. 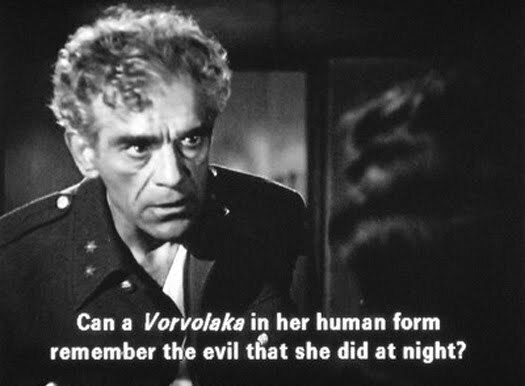 Rhonny Reaper picks her Top 5 Karloff films, on Dollar Bin Horror. Rogueevolent was inspired by a Karloff commercial for A-1 Steak Sauce! No kidding. See for yourself on The Roads of Autumn Dusk. Dravens Tales celebrates Karloff birthday in German, but you can (and should!) watch Past Tense, a complete episode, in English, of TV’s Tales of Tomorrow starring Boris, from 1951. Probably our only contribution from a sports blog, My Briefs looks back to August 1940, when Karloff’s Frankenstein Monster stepped up to the plate at an All Star charity baseball game. Buster Keaton and all Three Stooges combined could not stop Boris from hitting an inside the park home run. Radiation-Scarred Reviews contemplates La Muerte Viviente — The Living Death —otherwise known as The Snake People, a late career entry for Karloff and one of countless films he brought a touch of class to, whether they deserved it or not. 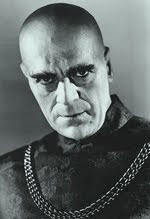 Writer Orrin Grey, I am happy to report, has learned to stop worrying and love Boris Karloff. All is explained on Who Killed Orrin Grey? There’s no other blog quite like Magia Posthuma, devoted to the serious study of vampires in history, fiction and popular culture. Here, host Niels Petersen examines the folkloric and mythological roots of the horrors depicted or suggested in the superior Karloff film, Isle of the Dead (1945). 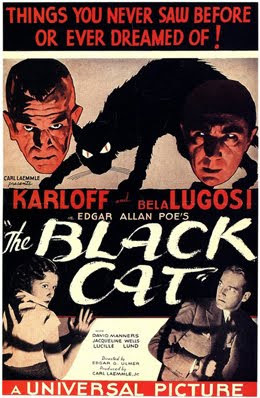 Thank you, Niels, for a terrific entry in the Karloff Blogathon! Here’s a very interesting article, A Modern Actor in a Classic Period, offering a rare and welcome analysis of Karloff as an actor, by This Guy Over Here. What do YOU have in common with Boris? Ian Maynard connects with Karloff in a very personal way. The Vicar of VHS dissects Targets as only he can, on Mad Mad Mad Mad Movies. It's a robust and entertaining analysis of an important film where Boris is called upon to play, essentially, himself, an aging, old school horror actor, at odds with the real horrors of modern America. Snakes on a blog! Snakes on a blog! Here’s another take on Boris’s psychedelic voodoo zombie movie, The Snake People, on Sleaze Bender. Boris cuts quite a figure, and chops a few heads off, as Mord, The Royal Executioner, in Tower of London, reviewed on Detours. Claire, over at My Illustrative Life, discovers Karloff, and hears the beating heart of The Bride of Frankenstein in The Misfit’s Dig Up Her Bones. Frankenstein Meets The Mummy, with Karloff in both roles! Uriel A. Duran created a terrific period poster for the film that was never made, for you to admire, on L.S.D. Letras Sin Desperdicio. “Dream of me,” says Boris. “We’ll become friends.” And we’re all willing to dream. The Lightning Bug examines Black Sabbath, the legendary 1963 collaboration of Boris Karloff and Mario Bava, and a film that has become a favorite with many Karloff fans. On The Lightning Bug’s Lair. Ivan G. Shreve, Jr. will be stepping through the Boris Karloff: Icons of Horror DVD collection this week. First up, reviews of The Black Room (1935) and The Man They Could Not Hang(1939), on Thrilling Days of Yesteryear. Imagine Boris as a chimneysweep, doing the Monster Mash, or warbling a duet with Bela Lugosi! Lots of links to follow and fun to be had via Need Coffee dot com. “The Monster was coming! The news went through my boyhood neighborhood like a lightning bolt.” So begins Martin Powell’s reminiscence of Boris and Frankenstein, a story that many of us will recognize as our own. On Paradise of Horror, Rick reflects on the tender and terrible lakeside flower scene, and The Real Beauty of Frankenstein. Are you one of the Frightened? Karloff speaks! From Boris Karloff’s excellent spoken word record of 1963, here's The Man in the Raincoat, and The Deadly Dress, posted on The Captain's Ramblings. 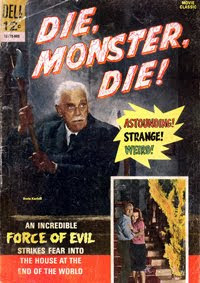 Senski, host of Heart in a Jar, remembers his first Boris Karloff comic book, and the day Boris died, February 3, 1969. In a long career, Boris Karloff got to work with an amazing range of directors. Uranium Willy reports on The Sorcerers, Boris’ collaboration with the controversial Michael Reeves. The review is peppered with great photos and a trailer. Now playing, on The Uranium Café. Interesting how, in a short-short essay about Targets, Ormsby’s Cinema Insane Blog manages to zero in on the essence of Boris’ performance. cool message from Sara Karloff! happy birthday to both her and her father! this is gonna be a fun week! thanks for putting it all together! It was awfully sweet of Sara Karloff to send along a message to share with everyone. She is very enthusiastic about the Blogathon and promises to read everything that is posted! Thanks, Diane, for your contribution. Ya know... I don't think I'm going to get much work done this week, what with all the great reading material that'll be showing up here. An excellent beginning to what could be the blogathon of the year, Pierre! You can find my contribution now on Flickhead. I'm so excited! I'm just finishing up my tribute to the master! I hope to have it posted tonight! Whew! Hell of a kick-off post, Pierre! My first BK contribution is here. This will be a fun week across teh internets! Yes, Kastle Karswell is not going to get much work done this week either... goddamnit, as if Frankensteinia isn't already awesome enough. Happy birthday to Sara and Boris! What a way to kick start this bloggathon - a message from Sara Karloff! My heart is all aglow. Looking forward to indulging in all things Uncanny this week - I should resign myself to the fact that I will get very little else done! http://bentinsmiscellany.blogspot.com/ and at the Oklahoma Film Critics Circle site. Thanks so much for doing this! Now I've got a pile of reading to do! The blogathon is as fascinating as I anticipated. Thank you for the kind words Sara. Happy birthday to you! ...and i love this blogathon! So great! Thank you Pierre! It is so amazing to see how many people are working on this. I'm so glad to be a little part of this. Happy birthday, Boris! I, too, am warmly touched by Sara Karloff's best wishes. What a fabulously classy lady. Little wonder that seeing her father in BRIDE OF FRANKENSTEIN was to utterly decide the direction of my life before I was even five years old! Happy Birthday to the Karloffs! Pierre, many thanks for your kind words. In an earlier comment I said this could be the blogathon of the year. Judging from the outpouring of passionate contributors, however, it'll probably be the blogathon of blogathons. That's a reflection on you, your inviting personality, and the excellence of Frankensteinia. 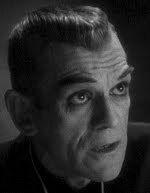 I am thoroughly enjoying your Karloff Blogathon. You and all your contributors are doing a great job. "This Is Your Life: Boris Karloff" was a treat. Nothing about his non-horror roles in "Five Star Final" and the original "Scarface"?